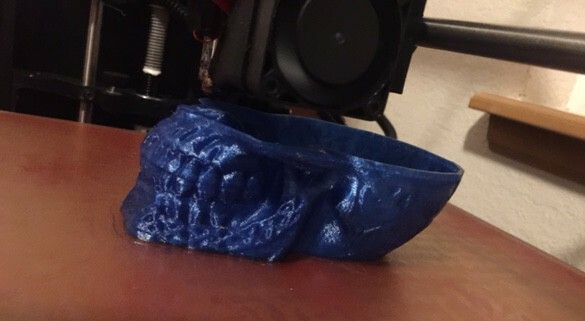 Since Halloween is approaching, I figured i would try printing out a 3D skull. 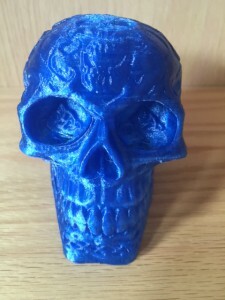 The model came from Thingiverse and was uploaded by 3DWP, which seems to be a 3D-printing company in the Netherlands. The skull is hollow, and has some serious undercuts, so I was actually surprised that it printed as well as it did, although there are some holes in the eye sockets (other than the ones that are supposed to be there!). This was my first time printing using t-glase, which is a slightly-glassy material that is semi-transparent. It is also kind of a pain to work with. It took several attempts. One thing I learned was to increase the temperature of the printer bed a bit to get the very thin base to stick properly (The first time I tried to print, I came back to watch my printer happily transferring a big ball of goo back and forth over where the model should be). For the moment I’ve just shoved a flashlight inside to demonstrate the translucency, but I’ll probably do something a bit more involved with some LEDs. 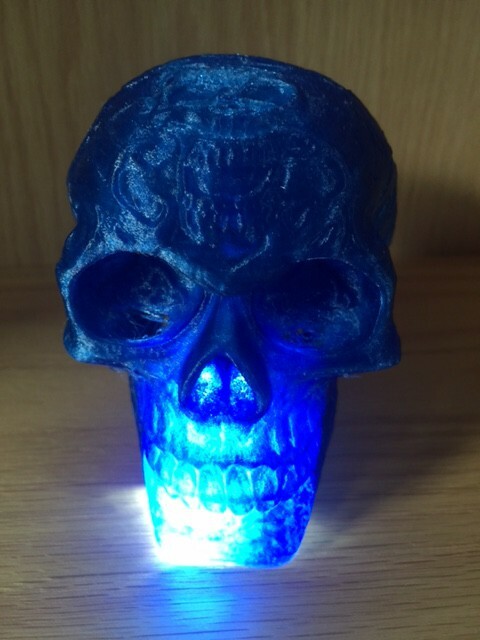 I might design and print a simple LED holder that sits centered in the skull.